This took place as usual last Saturday and was well attended despite the cold weather. 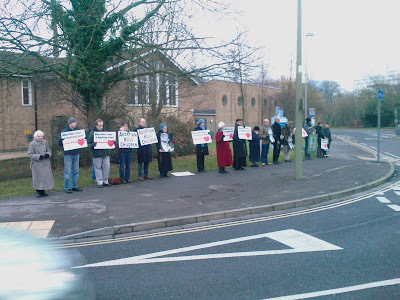 We prayed the Rosary by the entrance to the John Radcliffe Hospital, the only place in Oxford where abortions take place. The Blessed Sacrament is exposed in St Anthony of Padua and the witness ends with a short Benediction. The Rosary is led by Fr John Saward.